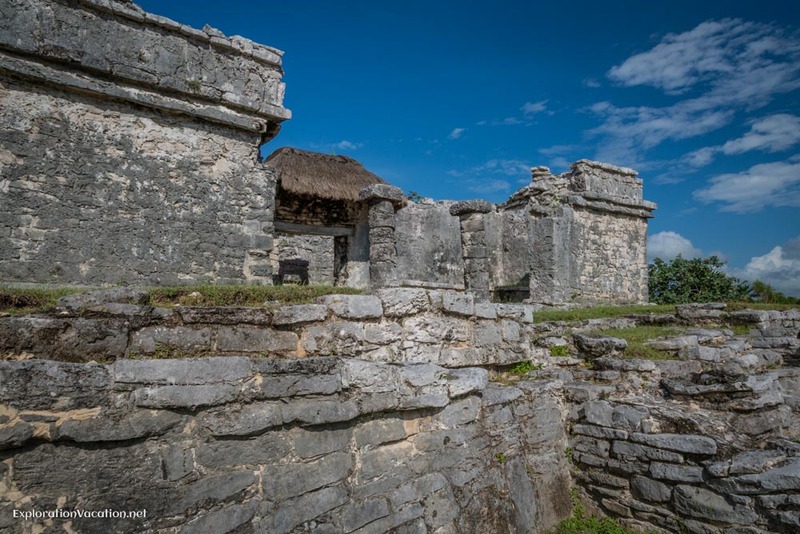 Although it is one of the smaller archeological sites in the Mexican Yucatán, the Mayan Tulum ruins are a tourist favorite for their fabulous seaside location and proximity to Cancun. It’s a beautiful and fascinating place, but it can be frustrating to visit. Consider the following before you travel to make your visit as enjoyable and meaningful as should be. 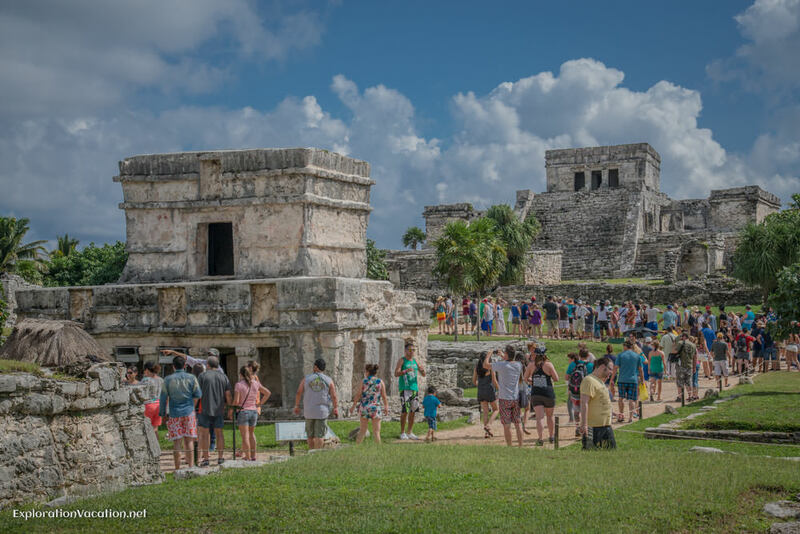 Because most visitors come from Cancun or Playa del Carmen, the ruins are most crowded in the middle of the day. Tour buses generally arrive after 10 am, so an early morning arrival will result in sharing the ruins with the fewest number of other people. We got a slow start and by the time we arrived at 9:00 there were already what seemed like a lot of people at the site. 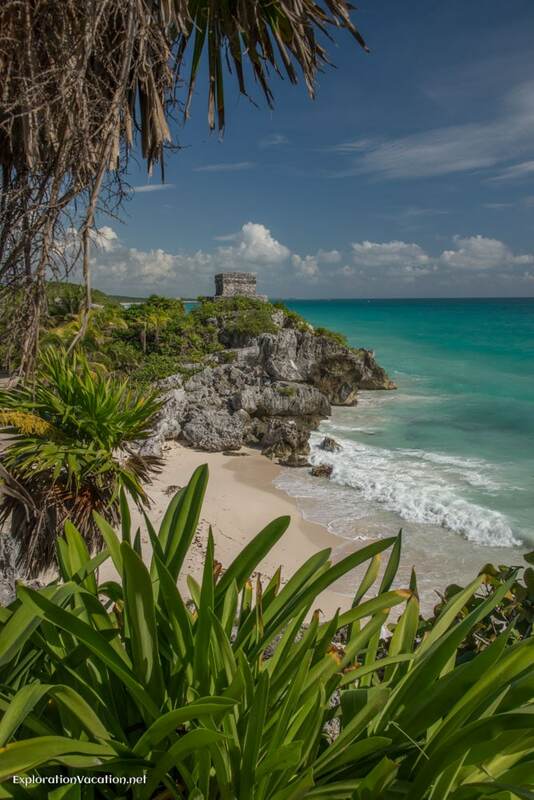 Tulum is a popular destination for day-trippers, as it can be reached from Cancun in under two hours or from Playa del Carmen in under an hour. 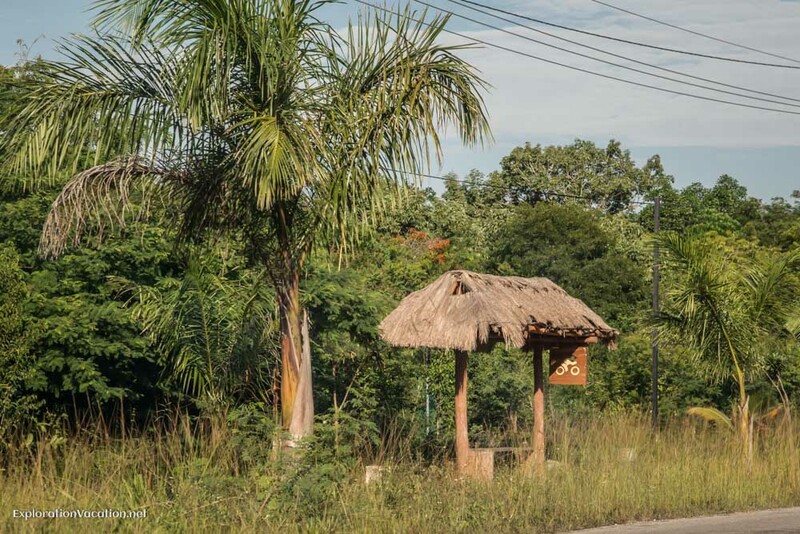 Transportation options include tour bus (it is easy, if expensive, to book a tour from either Cancun or Playa), public bus, taxi, private vehicles, and shared taxi/buses. 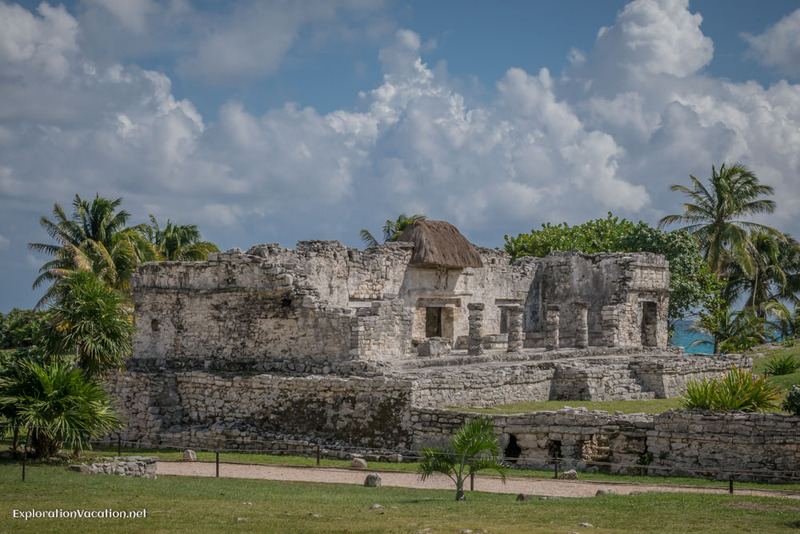 In addition, those staying in Tulum’s beach side hotel zone (which is a great place to spend a few days) will find it is an easy bike ride to the ruins. There is a large parking lot at the entrance to the park, with a fee for parking. There is an entrance at the end of the hotel zone, but it did not appear to be open when we visited. It is possible that pedestrians are sometimes allowed to enter here, so it’s worth checking if you are staying nearby. There is no parking at this entrance, so it would only be useful to those walking or biking from the hotel zone. Check with your hotel for more information. There is a ticket plaza at the entrance to the park. Entrance to the park was around $5 when we visited, with another $4 fee for parking. Note that there is also a $4 fee for using a video camera in the park. There is an additional charge to use the shuttle to enter the park (see below). Guides who speak a variety of common languages are available at the park entrance, conveniently located between where you pay your fee and where you enter the park. There are set rates for guides. While a number of websites indicate that you enter the ruins from the center, we were directed around the wall to the north end of the site. It isn’t a very long walk, but there isn’t anything to see along the way. A shuttle is available for a small charge. There are no maps of the ruins available when you enter the park and the signage posted within the park provides relatively little information, so bring a map or detailed guidebook with you. As noted above, guides are available for hire in the park, but they are relatively expensive for a very small group and the quality seemed pretty mixed. However, they are the only source of information on the site available once you get there if you haven’t brought your own. For the most part, the ruins are roped off to keep visitors from getting too close. Visitors are not allowed into any of the structures and none can be climbed. While this makes the experience feel a bit like visiting an art museum, it does ensure you can actually see the ruins no matter how crowded the park may get. There are restrooms and restaurants at the entrance to the park (before the hike/shuttle to the ruins). There are no facilities within the archeological site (the ruins) itself, neither restrooms nor a place to buy a beverage. (Private vendors are not allowed in the archeological site.) The park has very little shade, so carry plenty of water and use sunscreen. There are a few benches scattered about the park that would be a pleasant place to have a picnic and, as far as I can tell, picnicking is allowed on the grounds and at the beach. 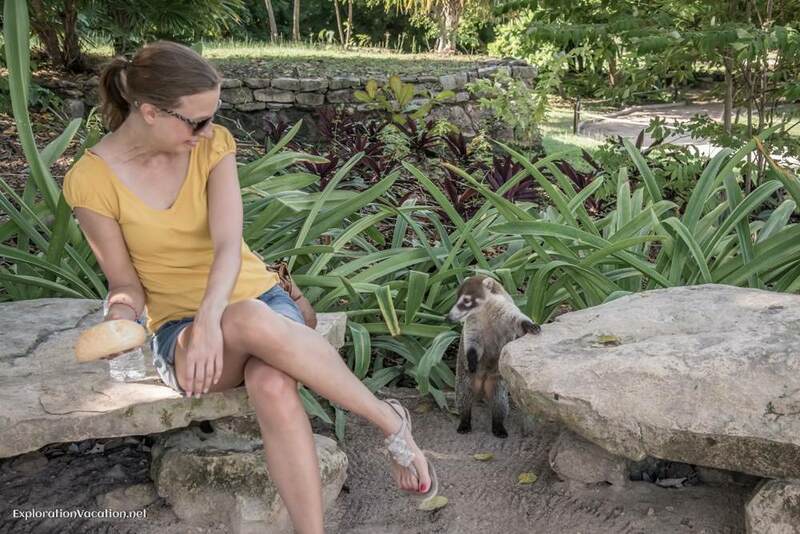 Just be prepared for a visit from the local wildlife. There are two lovely small beaches located within the archeological site. Both have beautiful white sand. When we visited in November 2014 both were closed. (The access stairs to one had washed out and the other had nesting turtles.) 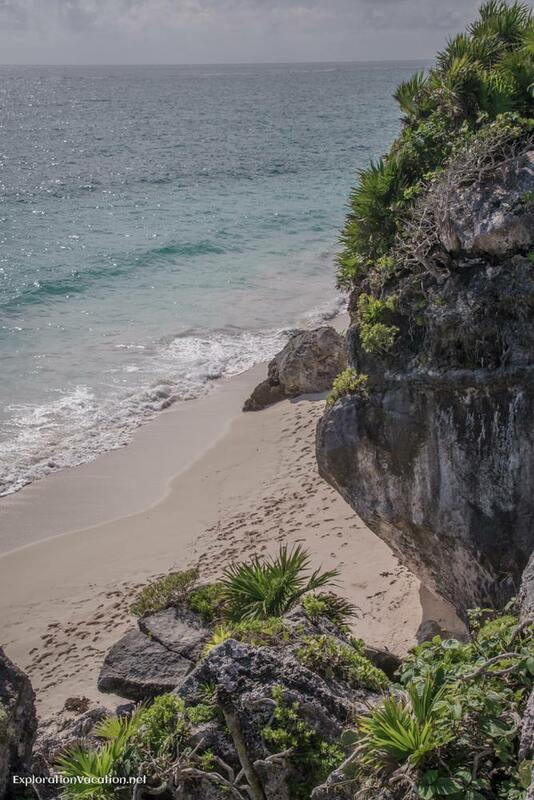 Usually the beaches are accessible from the ruins, but they can also be reached from the water. It appeared there may be some facilities (changing rooms, restrooms, etc.) at the main beach (where the turtles were nesting), but the whole area was closed when we visited. There are bugs, at least when we visited, so pack insect repellent along with your sunscreen. As noted, the park doesn’t open until long after sunrise and closes well before sunset, so photographers can never capture most of the ruins with the beautiful light of the beginning and ending of the day. However, some of the site is clearly visible from the water. There are plenty of boats available to take visitors out fora look at the ruins at any time of day (they can also ferry you to the beach), although he best images will likely be captured in the morning when the sun fully illuminates the ruins.You won’t be able to use your tripod, but you should get some great shots. Check at beaches near the archeological site or simply ask around to find a boat and captain – but choose a boat that leaves from a beach near the ruins to make the most of your time and avoid a potentially long and rough ride. These tips based on our visit in November 2014.